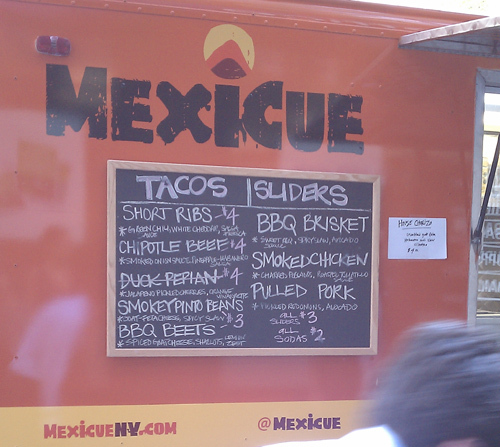 Thanks to Lunch’er Dave for passing along this one… yesterday, the brand new “Mexicue” Truck hit the streets selling a fusion of Mexican food and BBQ (think burnt ends in a Mexican rub, topped with an arbol BBQ sauce, and habanero salsa.) Yesterday they were in the Flatiron (on 25th and Park), and today they parked on 40th btw. 5+6th. We’ve got some pretty decent Mexican food in Midtown, and there’s the Daisy May’s Cart (on 49th 50th btw. 6+7th) when you’re craving that BBQ fix. But combined? This could be a game changer. The menu looks pretty great to say the least… and these press photos on Flickr, are, well… press-y. But they give you a pretty looking idea of what you’re getting. (Thanks to the forums for that link!) We will definitely be hitting this up soon, and early adopters should let us all know how it is in the comments. They’re already sold out for today, but to follow them in the future here’s their website, Twitter and Facebook accounts. Posted by The ML Team at 2:15 pm, July 27th, 2010 under Cart, Mexicue. sounds delicious. I’m looking forward to trying it if they hit up NW midtown. i can honestly say- this does NOT taste like street food. and thats a good thing!! it came out hot and yummy and prepared right before my eyes. three items were perfectly filling and i was pretty hungry. strongly recommend the brisket and the beet tacos (i don’t even like beets). the only problem for me is that this truck keeps moving.. i want it to STAND STILL and be there every day for lunch. I got there just before 1pm and already 5 of the 9 menu items had been sold out. Line moved pretty slow, and what were apparently the owners were just kind of standing around outside the truck acting only halfheartedly apologetic that before prime lunch hour started it was already almost sold out. The beet taco was absolutely delicious, as was the pulled pork slider (tho the meat was just the tiniest bit dry, it had tasted great). The chorizo taco was more heat than flavor – I adore spicy foods, but I like the taste to share the stage with the fire level. It’s definitely worth another try, if only to catch them when the ribs/brisket/beef/duck/chicken items aren’t sold out. It’s only their second day, but if they want to make it in this game, they need to be prepared for what the midtown lunch scene entails volume-wise. …oh, and for $11 I still wasn’t nearly full. and i don’t have a huge appetite to begin with. Hi MidtownMuse… Just wanted to make sure you saw our response below! Mexican & barbeque fusion?! Be still my cholesterol-laden, but still-beating heart. This looks and sounds too good to be true. But if it’s legit, it’ll be my go-to for four meals a day. First of all, thanks very much to Midtown Lunch for the mention yesterday. We can’t wait to hear what you think of the food. MidtownMuse: Thanks for your thoughtful feedback. We massively underestimated demand on our first week and did sell out of everything pretty quickly. But we’re learning quickly and we’ll have more and more inventory as we get a better sense for demand. We also only have two guys working the truck right now (who now have two days of experience in the truck), but we hope to hire a third person very soon which will speed up the process significantly. Regarding pricing, we’re still tweaking so I appreciate the feedback, but we’re buying very high quality ingredients from local farms, so things are expensive for us and we have to price items accordingly. But our goal is to allow people to get a solid meal and a beverage for under $10. I’m very sorry you thought we were halfheartedly apologetic that we had sold out of so many items. Without being overbearing, we were trying to address customer concerns as much as possible. The bottom line is we’re brand new (again, 2nd day out) and looking for ways to improve, so you’re feedback is very valuable. Hope to see you back again soon! Just got off the phone with them – they’re having issues finding a spot in FiDi so they are looking around Tribeca now…. Gotta love when a truck comes onto these comments. Thanks Mexicue truck dudes!! Like jerkface says, it’s great when the vendors take the time to communicate with their constitueaters and address their concerns and provide updates. The ingredients are very fresh, and it really doesn’t taste like “truck” food (tho lately, I would not consider that an insult). I actually like the smaller portions because it allows one to try a variety of items and doesn’t make ya feel like there was no point in waking up to go to the gym at 530 this morning. But even a couple of quarters to a dollar less on each item would help, and probably encourage people to order more. Will definitely be back next week to have another go, friends are already planning a swoopdown (that may or may not also involve cocktails from the southwest patio across the street – if the Mad Men can do a 3 martini lunch, a lil nip to accommodate Mexicue’s delish grub couldnt hurt). Hope to get an (almost, at least) full choice of menu items, but as I mentioned in my first post, it’s totes forgivable given you guys are just starting out (and hello, like a birkin, a lil’ “inaccessibility” also creates more hype/demand). Cheers! MidtownMuse pretty much nailed it. I was with a group and peeled of when I saw the truck as you have to take these opportunities when they present themselves! Glad I did. The line was definitely way too slow ( but then again there is plenty too look at around the park) and the sold out items were adding up as the line finally moved but the food was WELL worth the wait. These guys were pretty accomodating and made me the pulled pork as a taco (normally a slider) “beef style” which was with BBQ and habenero-pinapple salsa – awesome. I also had the brisket slider which was great and the lack of other red meat items forced me to get the smoked chicken slider. I am not a big chicken fan, but that was the star of the lunch – moist chicken with charred pablanos and a tomatillo sauce!! Was definitely the envy of my desk and will have a crew back to the truck next Tuesday.